High speed Flying scan a sublimated roll of fabric and take into account any shrinkage or distortion that may occur during the sublimation process and accurately cut out any designs. Dye-sublimation Trend is Driving Fashion, Fitness and Sports Clothing Industry. Apparel and accessories that are fashion-forward, on-trend while at the same time comfortable and functional has always been pursued. Sublimated clothing provides all that and more. The demand for unique personality and fashion sense in the clothing industry has greatly contributed in the popularity of sublimation clothing. Not only the fashion industry but even the activewear, fitness clothing and sports apparel as well as uniforms industries has taken great liking for this novel dye-sublimation printing technique since it provides vast opportunities for customization with practically no design limitations. 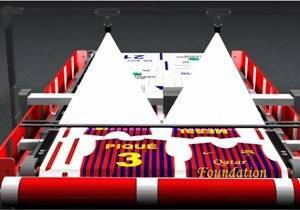 Laser cutting is the most popular cutting solution for sportswear industry. 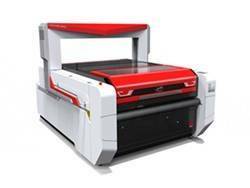 As a leading laser supplier for textile industry, Golden Laser launched the high speed vision laser cutting system for top speed cutting sublimation fabrics in rolls automatically. With continuous innovation, Golden Laser always focuses on creating the maximum value for our customers. 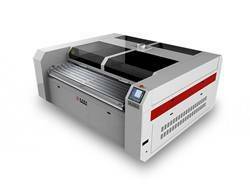 The VISION LASER CUT system automates the process of cutting out dye sublimation printed pieces of fabric or textile quickly and accurately, compensating for any distortions and stretches that occur in unstable or stretchy textiles like the ones used in sportswear. 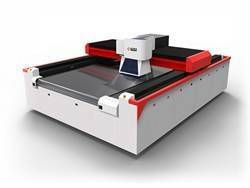 HOW VISION LASER CUTTER WORKS? What are Vision Laser System Advantages? Cameras scan the fabric, detect and recognize printed contour, or pick up on registration marks and cut the chosen designs with speed and accuracy. Accurate cutting at high speed. Clean and perfect cut edges - no reworking of the cutting pieces necessary. The Vision Laser system automatically compensates for any distortions or stretches on any fabric or textiles. Conveyor system and auto feeder for fully-automatic laser processing directly from the roll. Golden Laser has deeply explored the processing demands in the field of sportswear, and has launched a series of automated laser processing solutions to improve the processing quality of the sportswear, makes the production process simple, saves a lot of labor and time cost. "Nothing is faster than this machine; nothing is easier than this machine!" We have a complete laser processing technology, including laser cutting, laser engraving, laser perforating and laser marking. Test your materials, optimize the process, provide video, processing parameters, and more, free of charge. Deepen the demands of industries, with automated and intelligent laser application solutions to help users innovate and develop.